Guide to Beckbury Church. Click here to download a copy (Word Document 706Kbs). This includes information not found on this website. Like its neighbour, Badger, Beckbury once belonged to the Abbey of Wenlock and the church bears the name of the Abbess there. Milburga (daughter of the King of Mercia) took over from the Abbess Liobsynde who had established the abbey in about 680AD. It is not known when Beckbury became independent of Wenlock. Because it was a poor parish, Beckbury was omitted from several of the records of Wenlock's lands, and it was served through many centuries by non-residential vicars and curates, some of them not even in priest's orders. 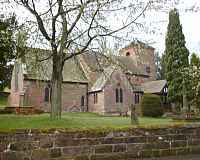 The building of the first church has not been recorded, but the chancel of the present church built of local sandstone, survives from the second half of the 13th century, though it was restored in 1884 and raised four feet (as can be seen from the half covered medieval piscina). The nave and west tower are Georgian, with a south aisle added in 1856 and north aisle in 1879. The Georgian church most probably included a gallery as there is evidence that there was a flight of steps up the outside of the nave. Beckbury church has not always been kept in such good repair as it is now, but in 1882 a new rector the Reverend J.J. Daniels, came and spent until 1910 restoring much of the fabric at his own behest if not his own cost, and he replaced the furnishings that had been destroyed at the time of the Puritans. Of particular note is the engraved stone set into the chancel wall which shows Richard Haughton and his wife, 4 sons and 6 daughters. He was a soldier in the time of Henry VII. In recent years, in addition to normal maintenance, the church has been completely rewired and redecorated, and there has been a major programme of restoration on the south windows. To view a map of the area in a separate window please click here. The services for each week can now be found in the monthly newsletter. See the information page.